This photograph has been scaled down; full resolution photograph is available here (999 by 537 pixels). Very interesting site.I have several naval books and made a number of models , ships and aircrafts. I´m a marine engineer with over 30 years at sea.Many thanks. Skúli. 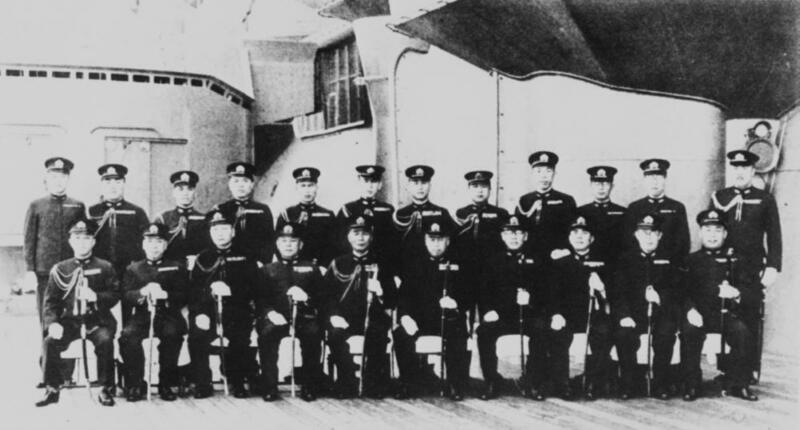 OFFICERS ON DECK: Admiral Yamamoto front row, sixth from left and his staff, early 1942. Photograph taken aboard Yamato early 1942. Did you know Yamamoto didn't learn to fly until later in his naval career. He understood the power of the aircraft carrier, and naval aviation.